We must have looked like right winos clanking through the Sainsburys off-licence in Forestside with a trolley full of Vodka, Kahlua, Morgan Spiced and Stella, but when a litre of voddie is £12/less than €14, it's a sin not to take advantage of the bargains! Then it was time to head to Tesco for the beer. As usual, I wandered my way around the store bemoaning the crap stock we are stuck with down here compared to NI Tesco stores... the fruit & veg is much cheaper and the variety is just great - more M&S than Every Little Helps. I located the Reduced To Clear section (my favourite) and got some Finest beef mince and chicken mince for the princely sum of £3. I love this section as it's where I save a bomb and decide on the spot how I'm going to use the cheap meat. This time, there was only one option... meatballs. 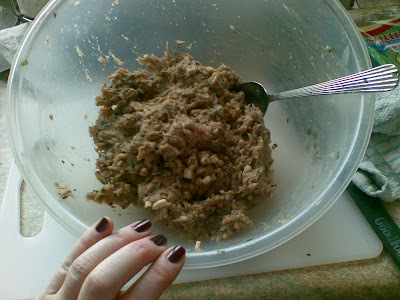 I use a mix of beef and turkey mince normally (as it's nigh-on impossible to get chicken mince here) and it cuts the fat content hugely, which helps with my WW efforts. I had picked up some fresh chives & flat parsley in Sainsburys so a recipe was formulating in my teeny tiny brain. 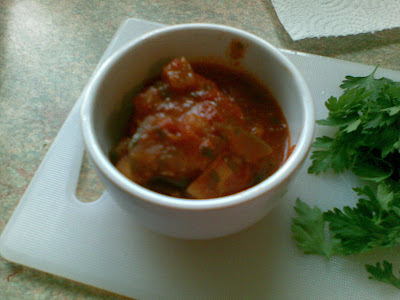 I started by making the tomato sauce in a large pot... well worth all the chopping. You'll never open a jar of Dolmio again! Saute the onions in some olive oil until translucent & soft. Add the garlic & fry for another 2 minutes. Season with salt & pepper. Add the rest of the vegetables & fry for another 5 minutes. Add the tomatoes, taste & re-season if necessary. Bring the sauce to the boil and then reduce to a simmer. Once you've sauteed the veggies for the tomato sauce, make a start on the meatballs. Get a large bowl and soak the breadcrumbs in some milk until all the liquid has been absorbed. Add the rest of the ingredients and mix until well combined. If the mixture is too wet, add some more breadcrumbs. Heat a large frying pan and add a small amount of olive oil. Fry a teaspoon of the mix to test for seasoning and adjust if necessary. 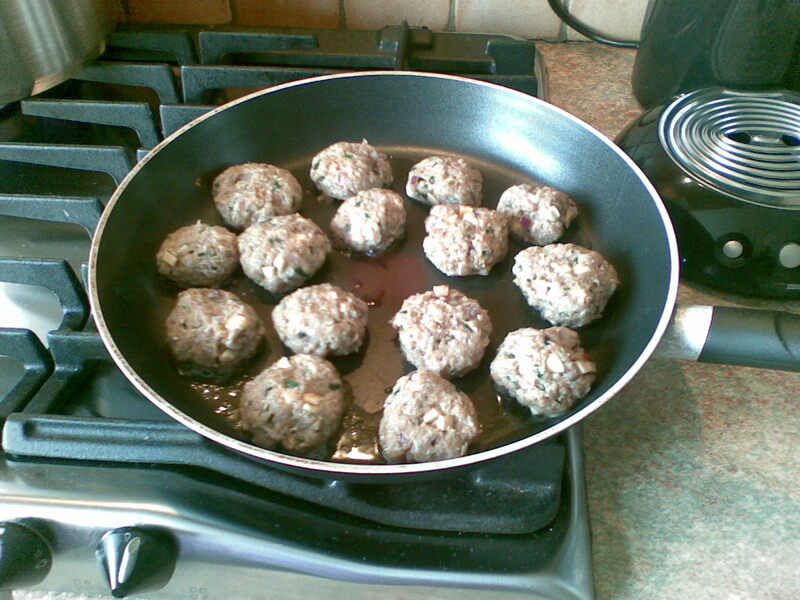 Using a tablespoon, form balls of the mixture and fry until brown on both sides (this quantity makes approx. 33 meatballs). 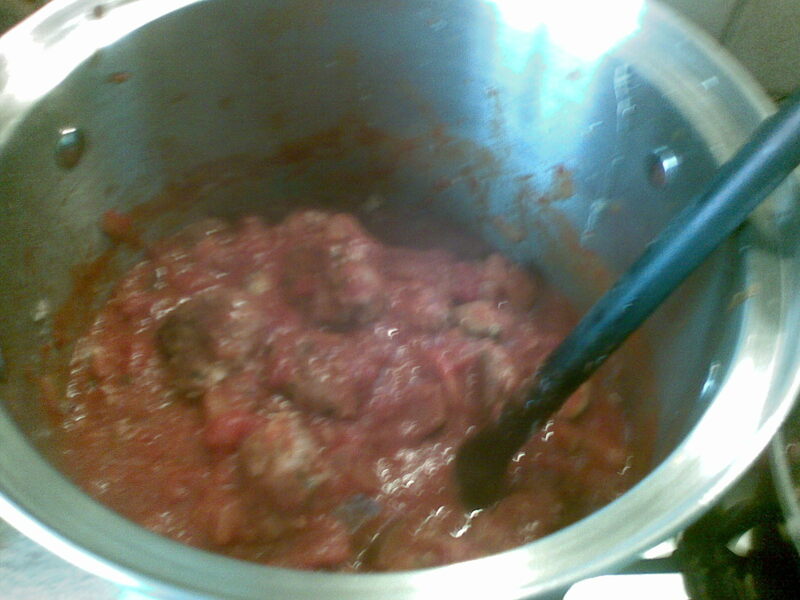 When all the meatballs are browned, add to the tomato sauce, put a lid on the pot and simmer for 30 minutes. Remove the lid and allow the sauce to reduce slightly. Add some more parsley & chives just before serving. This freezes like a dream... so it's perfect for lazy dinners when all you have to do is cook some pasta, rice or couscous to soak up the gorgeous tomato sauce. They sound and look delicious!! Think I'll try them tomorrow! I like the way you managed to get a shot of your new ultra violet nail polish into the post aswell!! Very nice! !